Chicago Illinois 151 North Franklin is a 36-story office tower located in the heart of Chicago’s “Loop” financial district whose design supports new ways of working. In a departure from the typology of the typical hermetic urban office tower, the base of the building is carved away at grade to create a four-story covered plaza that extends the adjacent park into the site and creates an urban public space which mediates between the city and the building interior. This public plaza is the first in a series of interconnected spaces designed to support collaboration. 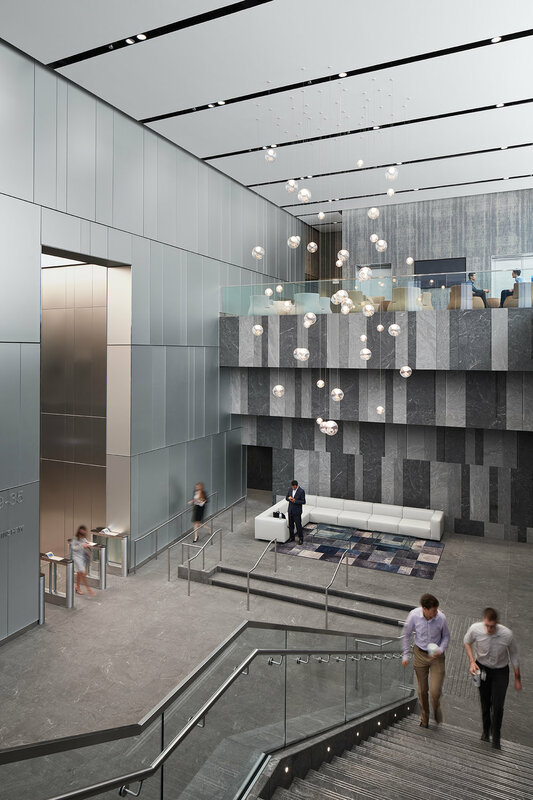 The building lobby features sunken and raised conversation lounges; a monumental stair leads from this lobby to lounge and meeting areas on a mezzanine which access a second floor outdoor garden whose atmosphere is quiet and contemplative. At the top of the building is a lively roof terrace with bar and casual seating and views of the surrounding Loop.